Have you ever seen a young child at the store or on the playground wearing an eye patch and wondered "What's up with the eye patch?" Did he injury his eye? Does he have an eye infection? Or maybe he is just pretending to be a pirate. When we see a little one with a cast on an arm we are pretty sure it's because of a broken bone. We ask "Oh, dear how did you break your arm? ", we listen to their story and then offer encouragement to the child. But for the young eye patcher a chance encounter with a stranger may play out differently. Eighteen years ago we were told by an ophthalmologist that my 3 year old daughter Mackenzie needed to wear an eye patch. He explained using unfamiliar and difficult to pronounce words that our daughter was legally blind in one eye. He went on to say that the treatment for her blindness was to place an eye patch on her good eye. "So wait, you are telling me that I have to put an eye patch on my 3 year old's good eye and force her to spend her day struggling to see with a legally blind eye." His answer was in a stern and scary tone, "Yes, this is a very serious condition, however you can improve her vision if you commit to this treatment." Well, I was determined to do everything possible to make this happen, after all I am "Supermom" right? 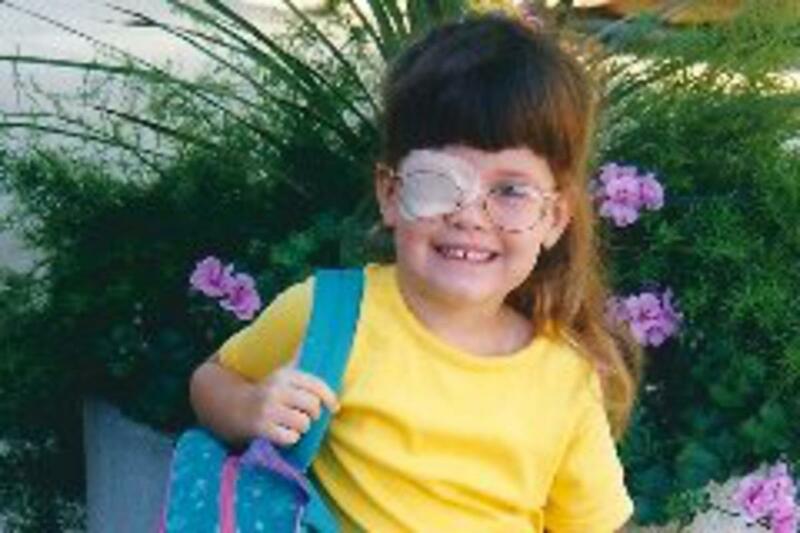 Mackenzie wore an eye patch everyday, all day, for five years. Okay, maybe not everyday and most likely not all day, but we did it, she has 20/30 vision in her lazy eye. The eye patching therapy worked! What surprised me throughout the whole process though was how people reacted to seeing this little girl wearing an eye patch. Some people were mean, others just stared, and a few even asked rude questions. I usually answered their questions kindly and tried to take time to educate them, but the negative attention did not help my daughter's self esteem. Fast forward to 2014 and it appears the world still does not understand why children wear eye patches because young mothers are encountering people who stare and make their little ones feel self-conscious wearing an eye patch. School is starting again and many eye patchers are fearful of being teased. It's sad and unnessesary. They need to wear an eye patch to save their vision. They need positive encouragement from friends and support from everyone. August is Amblyopia Awareness Month and I am asking for your help educating the world about this serious eye condition. Amblyopia (am-blee-oh-pee-uh) is a common eye disorder affecting 3 out of every 100 children. The vision in the eyes is unbalanced. One eye is focused and the other is not. A child with amblyopia needs to wear an eye patch on the "good eye" so that the "lazy eye" can be exercised and strengthened. If the condition is found early the child has a good chance of correcting the problem.